Trailblazer 9-Cup Aluminum Percolator Coffee Pot | BUDK.com - Knives & Swords At The Lowest Prices! 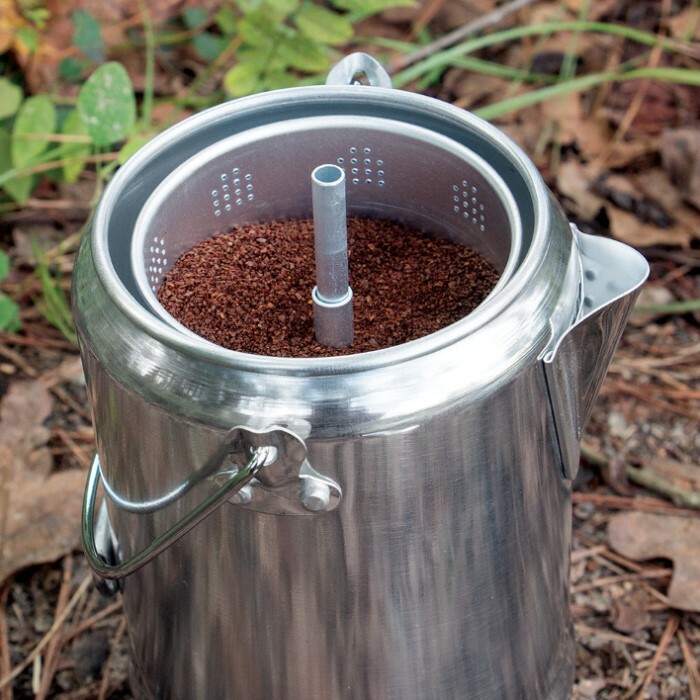 The perfect way to brew coffee on your camping trips has just arrived. 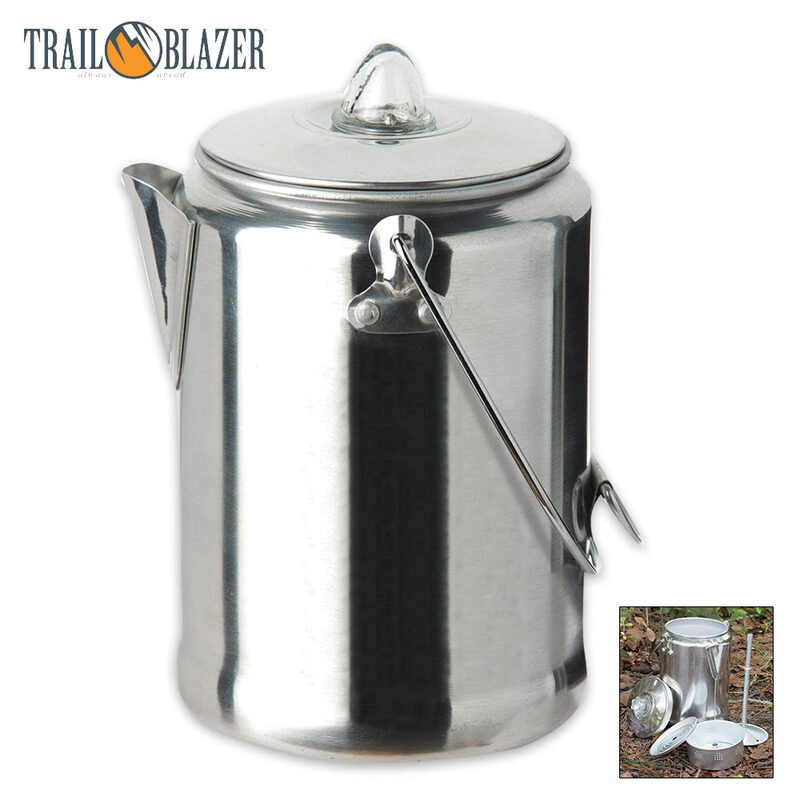 This Trailblazer Aluminum Coffee Pot is the very best way to get your caffeine fix while camping. It is made of rust-resistant, polished aluminum that heats up easily and cleans up easily. The 9-cup coffee pot has a percolator stem with a basket and dual handles on top. 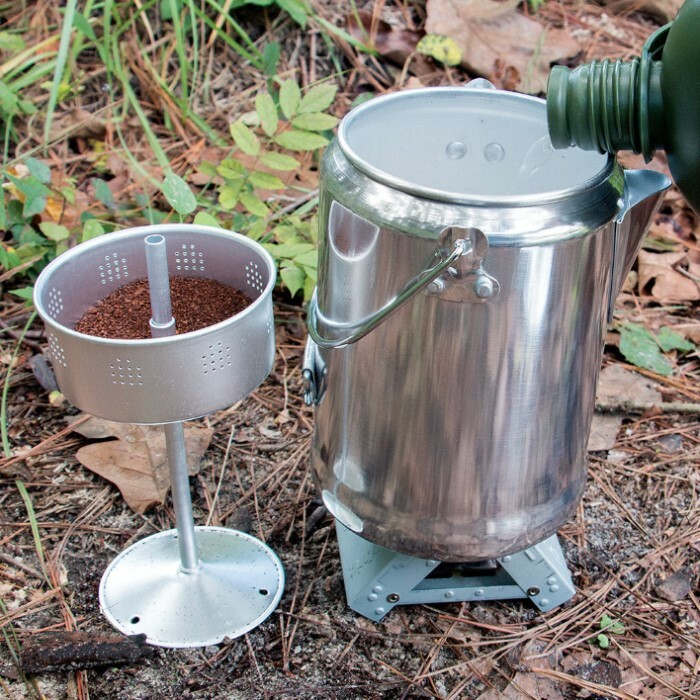 I bought one of these (along with the aluminum cups available on BudK) for the camping trip my girlfriend and I went on recently. Get a fire started and once you got some hot coals going, pop this thing right on there. When it gets boiling and you see coffee bubbling on the top, set it on a rack above your fire for 5-10 minutes and you'll have a great brew. I like it so much I use it at home on the stove top. Just like in my younger days! i remember coffee pots like this from my childhood! i bought this because i had mentioned i wanted one for when the power went out and obviously my friends had no clue as to what i was talking about...i ended up with one coffee(?) pot that none of us knows how to use and an electric! my friends are younger than i and couldn't remember ever seeing one like this! i have since introduced them to REAL perked coffee....they want my coffee pot now!! A power outage prompted me to purchase this item. Our single cup maker drew on the generator. This makes great tasting coffee. A real percolator, makes hot delicious coffee. I use mine on a gas stove almost everyday. Throw 4 to 5 pods in for easy clean up. Also uses regular grounds in filter basket. Need to adjust heat to keep from boiling over once it starts. After serving turn gas flame down all of the way on smallest burner to keep leftover coffee hot. Has a glass bubble on top for viewing when coffee gets dark enough to your desired strength. Nice for 2 to 3 people. There is nothing like the taste of good old percolated coffee.